Welcome to Literary Marie's Precision Reviews. 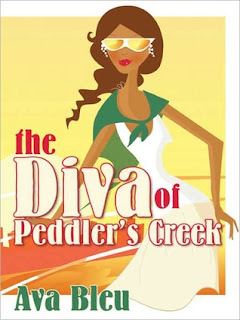 Today we have a special guest post from Ava Bleu, author of The Diva of Peddler's Creek. People ask me why I decided to write a modern African American romance based in a rural community. That’s simple–because I couldn’t find one on the shelves! For some reason when it comes to African Americans, we seem to judge art based upon how closely it reminds us of our own lives, as though our art expression must hold realism as a key component. The art must reflect our reality or it is not worthy. I urge readers to remember that fiction can be realistic, but it can also be fantasy, science fiction, historical and futuristic. It can be as close to what we know as true life, but it can also be as far away as the stars. Fiction is imagination. It should never have boundaries. That’s what fiction is all about—storytelling without bounds. Wherever our imagination takes us, thus go our keyboards. Romance novelist Taylor Beir will stop at nothing to get her mother off her back, including relocating to teach a little boy she’s never met how to read. But Christopher Doubleday doesn’t want to learn. Handsome older brother, Boyd, has an invisible stick up his backside. And she suspects sweet Mary and Jesse are trying transform her into the mythical “good girl” she’s never been; either by power of suggestion or bribing her with endless goodies from Mary’s kitchen. Taylor may be down—and stuffed—but she’s not out. Someday the townspeople of Peddler’s Creek, West Virginia will realize their hostility is misplaced and recognize her for the gentle, misunderstood soul she really is. And they will admit that Taylor Beir truly is the best thing to ever happen to their tiny, dirt road, middle-of-nowhere, backwater town of Peddler’s Creek, West Virginia…if they know what’s good for them. realized she was high in the air with no one to steady her. “What the hell…?” she said, grabbing the saddle. any more than she already knew. She took the reins quickly, annoyance making her movements jerky. “You are such a son of a…” She paired the last word with an angry kick. More of a jerk, really. But it didn’t matter whether it was a kick or a jerk, because a millisecond later the horse beneath her kicked up its front feet, taking Taylor high into the air. Ava Bleu lives and loves in the Midwest, countering bitter winters with smooth jazz and tasty edibles. A book-lover, author, artist and photographer, Ava believes creativity in any form is worth celebrating. She can be found in bookstores and the public library camped next to the cookbooks and/or on the town keeping an eye out for hero-material. Click here to order or add The Diva of Peddler's Creek to your reading wish list. Thank you for having me, Marie! Thanks for being a guest, Ava!